Polk Audio Ultrafocus 8000 review | What Hi-Fi? When it comes to design, there’s no arguing that these Polks are on the bulky side. Although they come with a carry case, they don’t fold down, making them quite a big pair of headphones if you’re looking with portability in mind. Despite a largely plastic finish, our review sample feels relatively sturdy, with colour options available of white and bronze, or black. 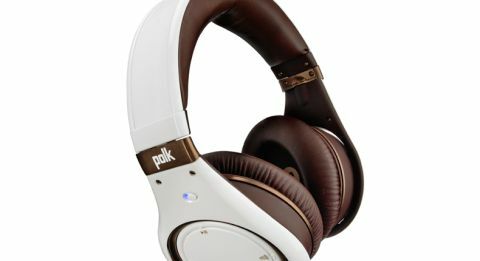 Instead of placing controls on the cable, which offers a flat, durable design, Polk has opted to put them on the right earcup. In theory this sounds like a good idea, but in practice it is a bit fiddly, plus you hear a plasticky click in your ear every time you skip track or change volume. The fit is snug but not uncomfortable, though we do find our ears get hotter in the Polks quicker than with competitors, perhaps because of this slightly tighter fit. A single switch handles noise cancellation, and without it turned on, music won’t play. Beats' Studio 2.0s also operate like this, but the saving grace in the Polk’s favour is that they operate on two AAA batteries rather than being rechargeable – so just make sure you always have a spare set with you. Depending on your usage, you should get 40-60 hours of playback before you need them. The effectiveness of the noise cancelling on the Polks is reasonable but not infallible, and some outside noise can creep in. We’d say they manage to block out a bit more than the likes of the Beats Studio, but don’t come close to the levels of quiet offered by the Bose QC25s. But then, not much does. Like the PSBs though, the Polks offer a really big sound. They’re not quite as powerful or as spacious, perhaps, but they’re just as confident and display real enthusiasm for most genres of music we throw at them, with a preference for lively, upbeat music. The Polks subscribe to a similar sonic signature to Beats Studios, with the balance tipping in the favour of a deep, warm low end as a priority. While they stop short of being overpowering or boomy – in fact the bass is quite taut and controlled – feed them a bassy recording such as Jay Z’s F.U.T.W and it becomes a touch overemphasised for our taste. The midrange is never muddied though, and is delivered with focus and clarity. As is the balance here, vocals are direct and full-bodied, but can lose a touch of intimacy in more delicate recordings. The emotional delivery of Rihanna’s Stay, for example, is direct and passionate, but loses the hint of vulnerability you’ll notice in more insightful headphones. For the most part, the treble is crisp and controlled, but does lack a bit of refinement. Play a brighter recording like Of Monsters and Men’s Little Talks and while you’ll hear more detail across the frequency range compared with something smooth like the Beats Studios, there’s a hint of coarseness here that can make them sound a little cruder. It’s not a deal breaker, but their unforgiving nature does mean that you’ll need to be careful with the quality of track you feed the UltraFocus 8000s. They’ll keep up with whatever you give them though, and are never flustered by complicated rhythms or complex instrumentals. The Polks organise System of a Down’s frantic Chop Suey! without a stutter, and devour the madness of Chase and Status’s Smash TV with ease. Their only issue in these situations is that of space. When there are a lot of instruments fighting to be noticed in the mix, they can start to sound a bit congested. Overall, this is a good pair of headphones with some provisos. There isn’t enough for us here in terms of refinement and balance, but they will pump plenty life into your music collection and make it an altogether fun experience. The extra detail on offer compared to something like the Beats Studio 2.0s just about makes up for the occasionally cruder sound, but a touch more insight and consideration for more delicate tracks wouldn’t go amiss. Their balance has caused quite the debate among the review team, and for a more even handed, refined approach, we’d certainly look elsewhere. But for an engaging, exciting listen, these full-bodied cans tick both boxes.